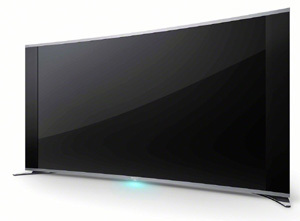 Sony claims the title of 'Worlds First Curved LED TV' with this one. Samsung and LG were first to get their curved OLEDs TVs out, but Sony sticks with technology that isn't quite as expensive here. 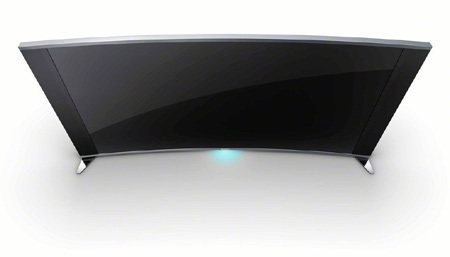 The curvature is designed to offer a more immersive home theater experience. Another big plus is the excellent on-board speaker system. The price is one of the biggest drawbacks here. $4,000 for a 65 inch 1080p screen is a bit much compared to some of the competition. As we've seen in other LED TVs from Sony this year, picture processing is top notch. This second tier model has a great processing engine called the X-reality Pro which is a step up from the X-Reality engine seen before. That means the colors are bright, accurately reproduced, and the picture is crisp. Passive 3D playback is another very strong aspect in the picture quality. Sony has really been pushing passive in their LED TVs this year and from what we've seen there is good reason. Crosstalk is also not an issue and even without 1080p to each eye the 3D picture looked very defined. Four pairs of passive glasses are included in the box. The curved screen aims to address the issue of side angle viewing as well by widening the range of optimal viewing angles. Sony's 4K XBR LED TVs from this year have boasted sound systems that aren't typically found built right into a set. The S990A follows in their footsteps with a 40 watt 4 channel system. These push out a great range of lows and highs that take care of the need for a sound bar or simple home theater set up. They are capable of creating a virtual 5.1 experience, but it doesn't replace the real thing. The design is very reminiscent of Samsung's half moon F8000 LED TV. The flat stand legs support the screen on the left and right. The width may end up being a problem for some with TV stands that are too narrow for the legs. We've seen the same problem with the F8000. The speakers are housed on both sides of the screen as well, similar to the 55 and 65 inch 4K models from this year. They are covered and look much less gaudy than the gloss seen on the 4K models. As previously mentioned, the S990A sells for a whopping $4,000. Some of the biggest pluses seen are the excellent on-board audio, Sony's top tier picture quality, and passive 3D playback that has been excellent across the board. In the end, the value is questionable on this one. The Samsung UN65F8000 is going to be one of the closest competitors (minus the curve) at about $700 less than this one. The sound quality isn't there on the Samsung, but the picture is one of the best we've seen this year on a 1080p LED TV. The Panasonic TC-P65VT60 is an excellent alternative on the plasma side of things and can be found for more than $1,000 less than the S990A.